Folks who are in jail or prison who do legal work to defend themselves or their incarcerated comrades are known as “Jailhouse Lawyers.” They are welcome members of the National Lawyers Guild-Mass Chapter, as is everyone who fights for freedom and liberation. 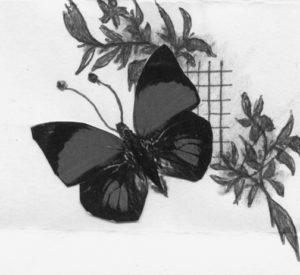 Butterfly A collage by Luis D Perez, incarcerated in NCCI Gardner. “Few people are better situated than jailhouse lawyers to observe the contradictions in society and, on occasion, to bring them forth into public view. For their services, for protecting the constitution from violation, their institutional reward is often a bitter consignment to the depths of the hole. The reason is actually quite simple: unlike other groups in prisons, jailhouse lawyers, in helping to free other prisoners or reduce their sentences, act to challenge how the joint is run. Jailhouse lawyers force prisons to change their formal rules and regulations, especially when they are illogical or downright silly, and for this administrators unleash their disciplinary arsenal with special vehemence”. One hundred forty jailhouse lawyers are members of the NLG-Mass Chapter. As part of our 2015 Resolution Supporting the Abolition of Prisons, the NLG-Mass Chapter is a prison abolitionist organization. That means we are committed to working toward a world in which prisons are obsolete. This work includes supporting the rights and organizing of prisoners, as well as calls to support their strategies and demands.